One hundred dignitaries and VIPs gather on the top floor of New York's newest, grandest and tallest skyscraper to celebrate its completion and official opening. As crowds and television cameras gather on the street outside to watch, unbeknownst to everyone is that a disgruntled sheet-metal worker is setting a bomb off in the basement. Unbeknownst to him is that the skyscraper is riddled with cut-price electrical wiring so when his bomb explodes it causes a power surge, setting off fires throughout the whole building. The people on the top floor become trapped and suddenly it's a race against time to save them as fire roars ever upwards towards them, turning the tower into an unapproachable fiery column of death. And that's the plot of The Tower by Richard Martin Stern, basically. It's a relatively simple idea for a story but it just so happens that Richard Stern thought of it first and subsequently it was turned into the film The Towering Inferno starring Steve McQueen, Paul Newman and a cast of Hollywood A-listers. The year was 1974 and the fashion in Hollywood was for all things 'Disaster', so you had The Poseidon Adventure, Earthquake, Airport and so on; films in which truck loads of Hollywood actors were put into impossible-to-escape-from situations just so audiences could flock to the cinema to watch them all suffer. And flock they did, turning The Towering Inferno into the highest grossing film for that year and earning eight Oscar nominations. 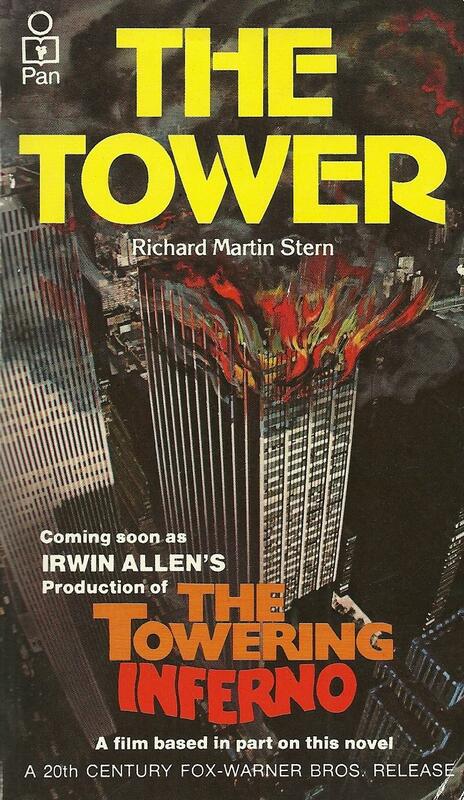 On reading The Tower today, it's impossible to not make comparisons to 9/11 and indeed the World Trade Center is featured in the book as playing an important role in the attempt to rescue the trapped dignitaries. Through the dialogue of the characters, the author asks all kinds of questions that would naturally be raised in such a situation although no answers are even attempted to be given. Instead, what we get is 303 pages of what reads like a script for an American, daytime television soap series. In hindsight, you can see that it's perfect material for a Hollywood blockbuster. Sometimes I read these books so that no-one else has to.